Who would like to have a soup sticker for their boat. Lets list the ideas and stuff and with a little input we can make a cool yet easy/cheap sticker. No more hey is that so and so? I can get them cut and mail them to madmike. should be real cheap if we keep it simple. when shouldnt have any issues as far as distributing them as most of us see each other on the regular. SIMPLE AND STRAIGHT FOWARD, no need to for anything else. SKIPJACK...........it's what's for dinner, TROUT.......... the other dark meat! I have been looking for a good striper sticker for some time now with no luck... I am not a fan of the 2ft stickers. Here is what i am looking for and maybe some of this can be put into the soup sticker. I am looking for one for the truck but would certainly put one on the boat. If you got them made cheap and sold them for a buck or two it could also help shawn fund the site. The small's are super small, like 2" by 1". I would suggest the mediums or the large ones. i was thinking something a little more distict. Thanks Dirk those are sweet. I will get one for the truck and use the soup sticker on the boat. It would be cool to try and use it for a SOUP decal. Maybe in black and white? I like all these and I think I will be getting a couple for the truck/boat, but I was thinking somthing a little different that would really distinguish our rigs from others. Now one of you guys with a little more culture than I can probably name the painting, but I think I can discribe it. 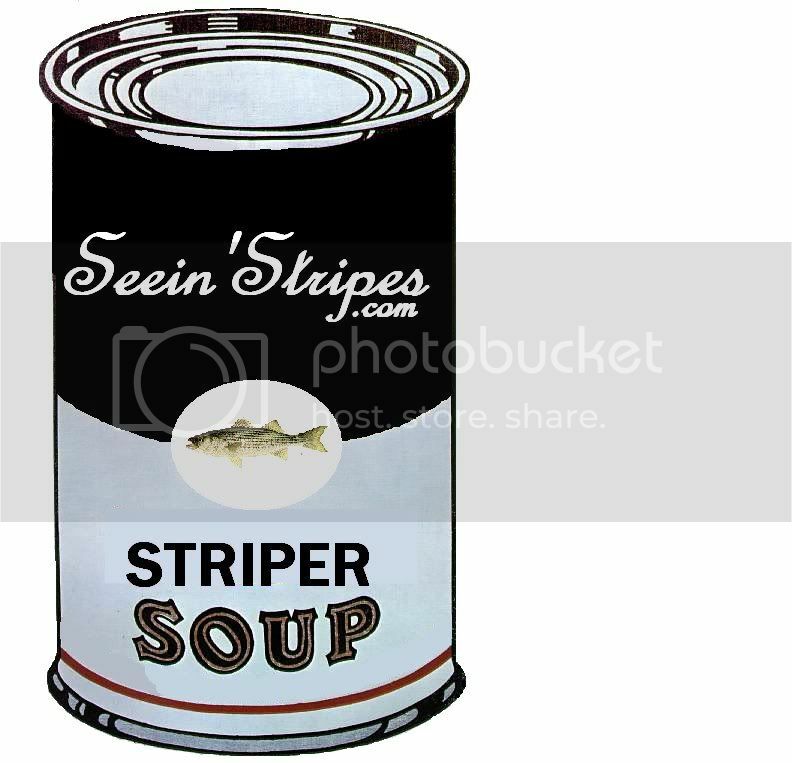 There is a really high society picture/painting of a soup can(I think it is a Cambells soup can to be precise) So I was thinking like maybe a small sticker of a soup can, but instead of it saying campbells maybe it should just be a white can with a striper on it. But at any rate, I would find it an honor to have a stiper soup sticker on my boat reguardless of what it looks like. so kudos to this idea!! Not much culture, but Norman Rockwell. Andy Warhol did the soup can. I am not much on wearing stickers or badges but this sounds like something I would participate in. I like subtle humor that you may have to read between the lines a little. i like the soup can idea - see there is an idea we can work with. not only is it unique but other people wont relize what it is. kinda a inside the soup thing. 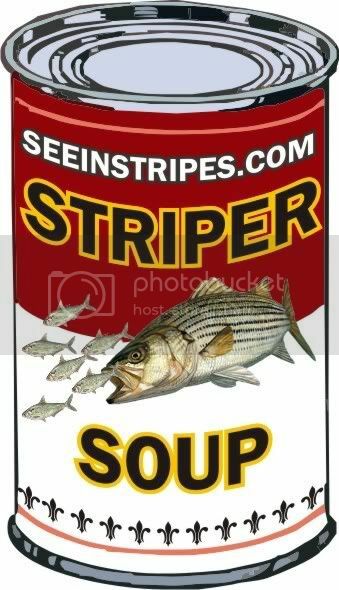 Bigger is Better Striper Soup? Heres something I came up with while I should have been working today. I liked the soup can idea as well. If any body is good at photoshop feel free to clean them up a little. I was wondering when the chef himself would chime in... I like the red and white one because it would stand out more and stays with the original campbell soup design. I have no idea how much it would cost to have them made, but it would be awesome to make them the size you see on the screen now. I would put them all over the place, so consider the first 6 bought. Yeah Sasquatch, I've been workin all day, so I'm must now catching up with you guy's stuff from the last two days.. I spilled a beer on my frickin keyboard last night and had to shut her down to prevent damage. Now every time I open my laptop, I'm gonna want a cold one because of the smell! That happens to me about once a week. I know a guy that does business cards concert flyers and that kinda crap, whenever we reach a final decision on a sticker design ( Im pretty sure he does those too) Im sure he would give us a good price. I got double sided full color business cards for life for 75 bucks off of him. Awesome, best one so far. Ive been sitting here messing with the striper image trying to get it cleaner looking. Posted: Wed Mar 26, 2008 10:24 pm Post subject: Oh my god Shawn! You have started a freakin' movement here on the Soup. Congrats! My boat is TOTALLY DEVOID of ANY lettering or decals, save the GA Registration. I would put a Soup Can on it for SURE! Put me down for 4! Sweet! Put me down for a few. Striper should be bigger and there should be a skippie or two being chased. holy freakin soup sticker thread. jeeees , let me run this by my guy! A T-shirt would be cool with that on the front, and the Ingredients (members names who actually post a report every once and a while) on the back. Thats a pretty cool idea. i will get in on a few of those. Thats what I'm thinking. I've got five boats and two trucks, so a couple just ain't gettin' it. Ace the G in Seeingstripes and you've got some great lookin' stickers. I know what you mean, everytime I mow the grass I find another boat . If I bring home another one I have a feeling the wife will have me sleeping in it. Put me down for a small pile of them stickers. Okay, I must admit that is a WAY slick design. However, aside from the typo in the web address, I feel like my name doesn't need to be on there. Let's try the same design minus the "g" and my name. I love the school of bait, too. The come in the soup! 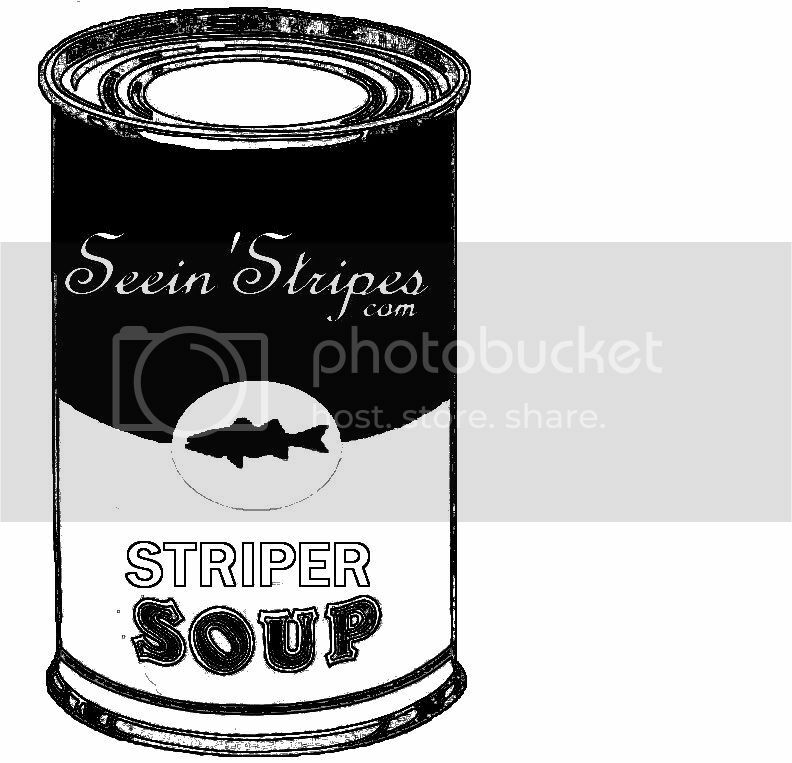 Anybody else wanna give it a try or is this our new official "in da club" striper soup sticker? Yeah that one is really cool. Posted: Sat Mar 29, 2008 3:04 pm Post subject: We have a winner. With Shawn's modifications, It's a winner! Let me know when it hits the press!! I think we have a winner. It will be hard to top that one. I have this in Coreldraw if the printer wants a vector instead of a jpg file. Printers love vector files as they can scale them up all day long (the fish are bitmaps but the rest is all vector). Can I get a decal or two in exchange for the artwork? **PS - I changed the original file on photobucket so the image in the thread from earlier should have changed to the 'corrected' version as well. Oh, it will also work for t-shirts, *BUT* you would need to find a shop that has a inkjet "direct to garment" textile printer. Otherwise the costs would be too high to get a true four color seperation to get the photo-realistic fish. A "DTG" shop can also do small runs instead of wanted something like 12 dozen. (2nd job is screen printing, but I can't do DTG and would not want to do 4 color either). There should be some in the metro-Atlanta area who can print it on the shirt blanks. When you talk to the decal printer about these, make sure they price you the UV resistant decals & ink made for full sun exposure (outside advertising grade stuff). Otherwise these babies will fade in a matter of weeks. I replaced the original with the "g" with the current version - same file name so both links updated to the current version. OK i need a total number of stickers needed, this needs to be a number cause a couple or a few is hard to count. these are for 4x6 rectangle with the can printed on them, add 140.00 to the total for the can shape cut out. Count me in for 10, more than enough for now and some spares for any new toys I get. if they have the "UV resistant decals & ink made for full sun exposure (outside advertising grade stuff)"